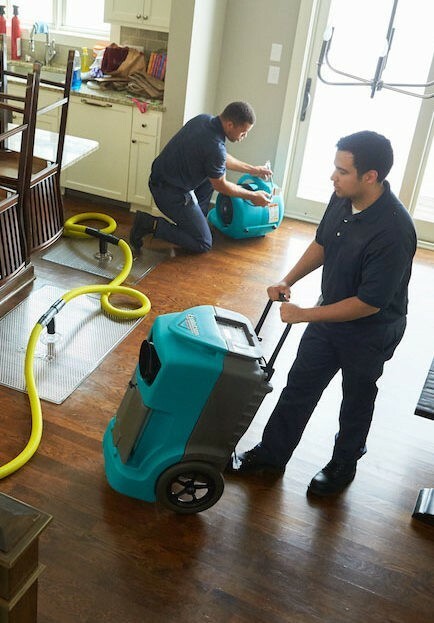 Most companies will tell you that water damage mitigation is a complex and involved process. It is complicated and it is impossible to predict in advance exactly what actions will be necessary for a complete and proper restoration. However, here is a simple step-by-step overview so you can get a basic idea of the dry out process. After receiving a call or e-mail from you, we will schedule an appointment, usually the same day or next day. When we arrive, we will inspect the water intrusion and determine a course of action. The first step is to find and stop the leak. We will check the moisture levels of your floor and wall coverings (drywall and plaster) and determine which areas have been affected. Based on this, we will figure out which equipment we need to mitigate the damage and how much of it. We will deliver and set up our mitigation equipment, in order to dry out the water that has been absorbed by your structural materials. 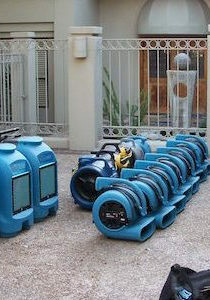 We will monitor our equipment readings to ensure that the drying process is working correctly. Throughout the drying process, we will document our equipment readings and continuously check and recheck the moisture levels of your structural materials to ensure that the drying is proceeding correcly and without issues. As your property dries, we will make the necessary adjustments to equipment positioning and quantity so that we can focus on the areas that need attention most.